I often hear the phrases ‘negative drawing’ and ‘negative space’ used as if they are synonymous. They aren’t. Negative space is employed as a brain-fooling method of seeing shapes with clarity. 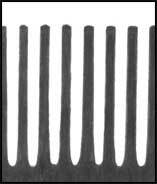 Negative Drawing is a conscious method of working that isolates and protects areas of your paper. These areas can be entire elements that are often completed later; smaller areas where the intention is to leave them as virgin highlights or white shapes against a darker background; or minute areas that, for example, form white hairs between their cast shadows. To further dispel confusion, Negative Drawing does not involve any form of erasing. Applying graphite and cutting into it with an eraser could be described as ‘drawing in negative’, but it is the exact opposite of true Negative Drawing, which primarily exists to isolate and protect virgin areas of paper. Think of it as defining the boundaries of a shape using only the tone that surrounds it. In other words, you aren’t drawing the object but simply giving the illusion of the object by drawing around it. 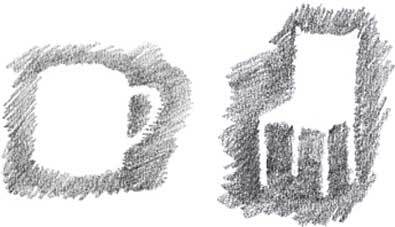 Negative Drawing involves the conscious creation of negative space so let’s study that first. The brain would seem by all accounts to store memory in the form of images, and these images, or symbols, are the mainstay of the it’s defence mechanism. Matching to stored, standard symbols offers a very speedy classification system. However, as artists, this facility works against us, because our brains automatically overlay the images we see with a range of symbols. This effectively disables the ability to produce realistic drawing because the information gathered is so basic – and often inaccurate if the brain’s ‘guess’ was incorrect. Fortunately, there are many ways of fooling the brain into letting go of the desire to match symbols, to classify, during the act of drawing. For example, working faster than you can think serves to disable the argumentative side of your brain, which struggles to keep up and then loses interest. To learn to see what is really there and not what you think is there, you need to take your brain’s automatic reaction out of the equation. Believe me, learning to see correctly really is a hard lesson to learn but the best way involves fooling your brain into not recognising the troublesome features. Fortunately, we have Negative Space as a supreme tool. Now do the same to the left hand end of the other strip and, without drawing any lines, leave an oblong clear in the bottom corner. Now take a clean sheet of paper and lay your two strips end to end with a gap between them.What you have drawn is the capital letter ‘L’. That the letter exists is entirely due to negative space. The white of the letter is pristine, not a result of the removal of graphite.Practice drawing articles you know. Try to picture each on the page and then shade around it. Don’t draw lines around them first – if you do, you’ll just be shading around a positive shape, not shading the negative space to cause the positive image to appear. Since these abstract shapes share a continuous border with the object, when you draw the negative shape, you’ll be drawing the positive outline too. Where Negative Space involved the art of drawing the areas around an object to define the object itself, Negative Drawing involves the deliberate creation of your own negative space. So, what exactly is ‘negative’ drawing? What do you see when you look at the picture to your left? Do you see an ancient black drinking cup? Maybe an ebony candlestick holder? Or do you see two white faces both looking at each other? Imagine yourself ‘seeing’ these two faces on a white sheet of paper and then filling in the space between them so the faces are revealed. That is Negative Drawing! A ‘negative’ image is one that is entirely created by the area surrounding it – I prefer to call it ‘white space’. The uses of negative drawing extend from creating bright highlights that describe the curvature of a dark object, or white shapes defined by their shadows, to the isolation of key elements that can be better drawn at a later stage. You can’t draw white with a graphite pencil so, like a watercolour painter, you have to draw around it to define its shape. Teaching yourself to see white on white and drawing around it is one of the best lessons you will ever learn. If we draw three lines (below) how many lines have we created? The answer is five – three black and two white. Let’s make that more obvious. I’ll extend and join the black lines, increase their number and join the white lines too. Which is dominant or positive? Are we using negative drawing? Right now we can’t say. They share equal importance, as neither has yet been defined as an object. So let’s do that – we’ll zoom out until one or the other becomes a defined shape. 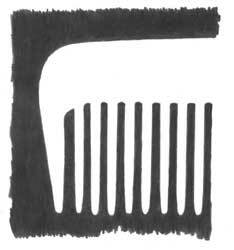 Now it becomes obvious that the subject is the white comb. It existed only in my mind until I enclosed it by defining the dark negative space.It ’s not easy to begin thinking this way. However, with practice, negative drawing becomes second nature and, more importantly, you learn to switch your mind between negative and positive drawing at will, and even to blend the two together. Negative Drawing, if you’re drawing spontaneously, involves ‘seeing’ a white shape on white paper and shading around it. The same is true if it’s planned beforehand, but then you’ll have guidelines to assist you. Negative drawing offers important advantages that no other system can fully compete with. • It can divide a task into simple, manageable elements. No erasing is involved. Your whites remain pristine, and your paper’s tooth is preserved for really crisp results. 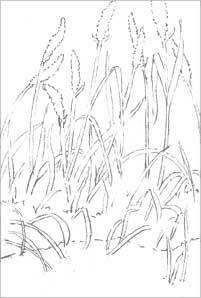 • It permits you, when drawing spontaneously, to quickly create white objects on the paper by simply drawing the shadows between them – hair and grass, for example. 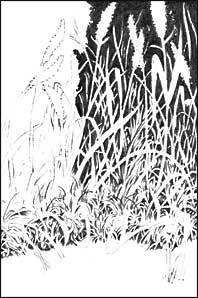 You can do this without any thought being given to form or spatial relationships, as a final layer of tone applied over the area supplies the tonal shaping – either locally (a single blade of foreground grass) or globally (the overall lighting that’s affecting the area). • It permits you to split your drawing up into elements that you fully understand and those that you don’t. By drawing around the unknown elements first, you often gain a better understanding of them. You can literally draw around potential problems and return to them later. • It permits you to split your drawing up into areas of texture. If, for example, you’re drawing the wooden side of a barn, it’s easier to concentrate on, and complete, that texture by simply working around anything that overlaps it. • It permits you to split your drawing up into areas of differing importance to afford much greater control over tonal relationships. For example, you can establish the background before the foreground to give much greater control over the visual separation of the two. You can draw into the created white silhouette after you have established the tones surrounding it, so when you begin to draw the enclosed element you can control the tones you use to make it stand out – or not, if that is your aim. You can see below that I drew around the rope because I needed to control the way it stood out from the background. Drawing the rope first would dictate the tones available for both the dog and the background, which is not at all what we want. 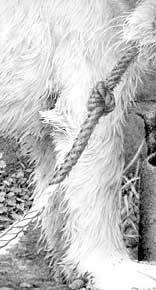 In this case the rope passes in front of both the dog’s white leg and the dark ground. By drawing both first, I now know exactly how to make that rope stand out – and how to make it blend into the ground at its lower end.Negative drawing will allow you to concentrate on one aspect at a time. Using my way of working from dark to light, you establish the very darkest tones first. Now you know your darkest tone and your lightest (the white of your paper). The black is then extended and diluted as required to form the mid-tones, and drawn around the highlights, features and problem areas. When the black or dark areas are completed, all your lighter tones will just be flat white spaces. Now, with the full understanding of the tones surrounding them, you can begin to draw within the spaces to give them the tonal values and shaping that they require. This is much easier to practice than explain! However complex a job may appear to be, it’s always possible to break it down into manageable elements or processes. Here, in this small 2” x 3” (5 x 8cm) drawing, I’ve mapped out the main stalks; lightly drawing a line either side to delineate the space that constitutes the stalk and leaf. Remember that you are defining white space so be aware that it is the inside edge of your pencil line that counts – you are drawing that line around a white shape. Having planned and defined the main stalks (I call them ‘status’ stalks – they’re food for the brain) I’ll switch to a more spontaneous style of working to map out the less distinct grass on the rear-most plane. I rarely outline anything in these areas but create stalks merely by drawing the negative space. Here is where you let your imagination go free, working at a pace that prevents conscious intervention. You will find yourself introducing stalks here and there that may even surprise you with their placement. Don’t try to be too accurate – inaccuracies lend an extra realism in this case. 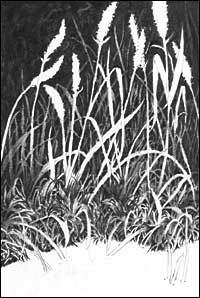 And don’t touch those ‘status’ stalks – they are ‘unknowns’; you cannot properly define their tonal values until you have completed the grass behind them. As you work on this secondary area between the established white spaces that represent the status stalks of grass, introduce random shapes and lines. 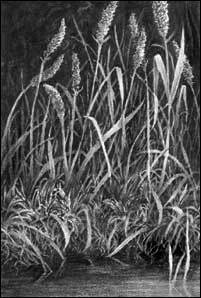 As long as these vaguely follow the rules of natural grass and foliage, they will serve to fool the brain into seeing more detail than exists. In life you couldn’t distinguish every element in such an arrangement (especially in areas of deep shadow) so you shouldn’t be able to do so here either. Now picture yourself looking into that area and begin to add reality to the situation; toning some stalks down a little and others so much that they are barely discernible. If you can see the reality in your mind you will achieve a sense of reality in your drawing. If you’re not sure how to treat something, leave it white then go back to it once it’s surrounded – as I have done here with the foreground. It’s going to be water and I can’t draw the reflections until I know exactly what reflections are required. Finally, with complete control over their appearance and recession, the status stalks are given body, adjusting the tone of those behind them if required. 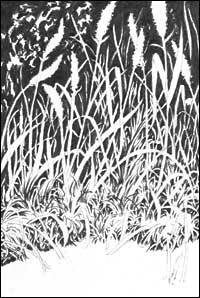 The foreground grass is drawn, just as I described earlier, and the water and reflections established. Negative drawing offers the means to tackle complicated tasks in manageable stages and, within the white space, presents the opportunity to draw perfectly and completely, without alteration or experimentation. Getting it right the first time will always give a sharply defined finish that all other methods muddy. It’s a liberating and controllable way of working and scores above all other methods in the drawing of complex negative shapes. Mike Sibley, who is renowned for his meticulous studies of dogs, lives in North Yorkshire, UK, and has been drawing professionally for over 25 years. Mike also runs Starving-Artists.net – offering free and subscription galleries for artists needing a Web presence. As a result of publishing “Drawing from Line to Life” in 2006, Mike now runs drawing workshops in the UK and USA. 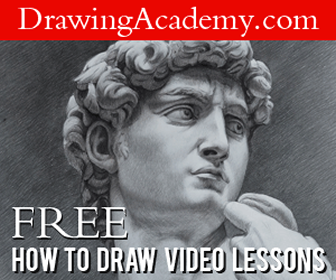 Further graphite drawing tutorials are also available from his website. AS ADRAWING INSTRUCTOR, I LIKE TO LEARN NEW TECHNICS IN THE ART OF DRAWING, SO I THINK THIS IS THE PLACE FOR IT. very good i like the way you drawed a picture then changed it slowly so that people knew how to paint a negative drawing them selfs but when you put drawings on there put a artists painting with a title and the artist so that if people cant find a picture of a negative drawing it’s there like when i was looking foe a negative drawing picture for my art homework i couldn’t so i clicked on this website thinking there would be a picture that was labbled and belonged to Tony cragg. This exercise will also help students create a full range of value by forcing them to notice the balances that exist between the darks and the lights. Very thorough post.